Chef Peter Prime was born in the Republic of Trinidad and Tobago, a beautiful twin island country in the South of the Caribbean. He grew up with his parents and has fond memories of being in the kitchen with his mother, Glenda. He recalls the vibrant, fragrant Trinidadian spices that seem to still linger in his senses as he speaks about how he would follow her around the kitchen as a child. This truly shaped his love for cooking from an early age and today he continues to apply her influence. Once in the states, Peter spent the latter part of his childhood in the DMV and attended Morgan State University. With a degree in Hospitality Management, Peter then set out for a career in the culinary arts and enrolled in the French Culinary Institute in NY which further solidified his passion. Upon graduating, Chef Peter was ushered into his career path by Chef Joel Hatton, the Executive Chef at the Leopold Café in NY who offered Peter his first job out of Culinary School. He began as a Line Cook and finished his tenure there as Sous Chef. Since then he’s worked with some of the most talented Chefs in the industry, including Todd Gray and Michel Richard with stints at Equinox and Central. Today Chef Peter Prime is beyond excited to reign over his own menu at Spark at Engine Comany12. His vision for Spark is to ignite the reception and appreciation of flavors and traditions from his native Trinidad. 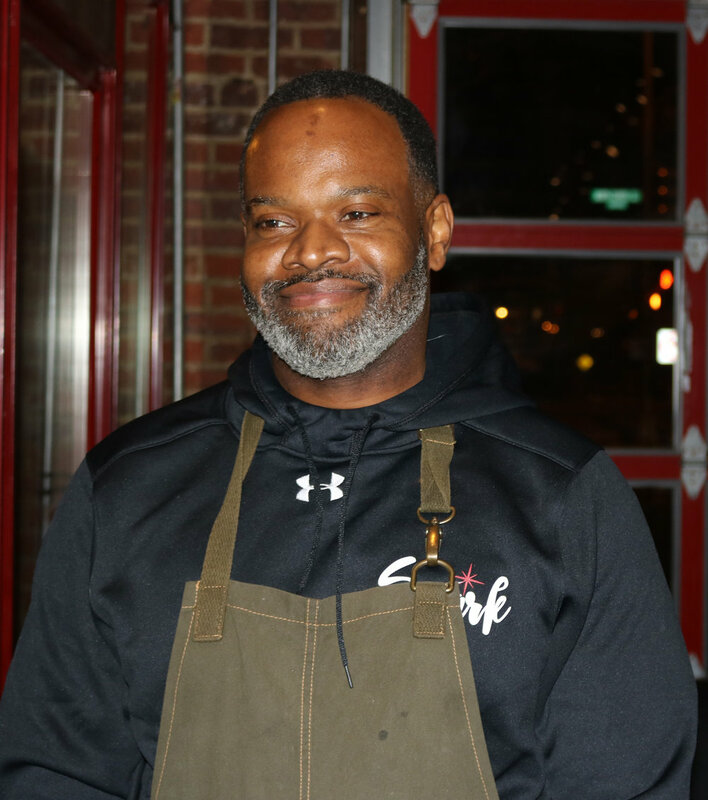 Grilled and smoked meats flanked by appetizers such as jerk wings, beef patties and fry bread speak to his first culinary inspirations as a kid. The communal dining experience offered at Spark is also a testament to his Trinidadian heritage. However, a dining experience created by Chef Peter is one that will also reflect culinary traditions from round the world and also highlight influences from his 2nd home, New York and culminate with all of his experiences of his current home, Washington, DC. When not in the kitchen, Peter enjoys spending time with his wife Mary and his son Judah. They enjoy checking out new restaurants in DC’s budding culinary scene, hiking and hanging out with family. Particularly enjoying gathering with eating food prepared by his mother and sister.